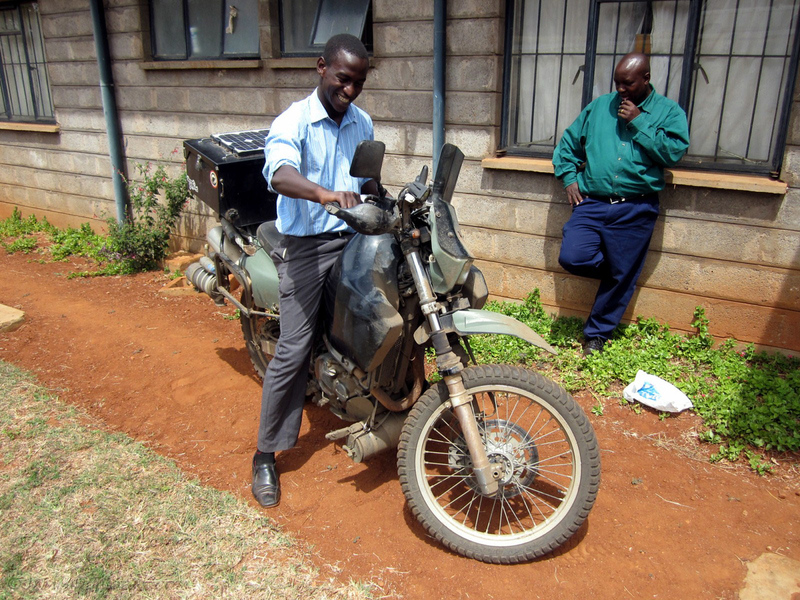 I was taking a break in Kenya primarily to conduct research for my masters thesis in sustainable development. I was taken on by ICRISAT (International Crops Research Institute for the Semi-Arid Tropics) to conduct research on gender and agricultural water management use under a bigger farm water productivity project. I spent my first few months in Kenya getting settled down and getting myself acquainted with the research and formulating a satisfactory research proposal, which got me some funding to cover my research expenses. With all that taken care off, I moved out of Nairobi to my field site of Machakos and Makindu in Eastern Kenya for the months of January and February to collect the data for my thesis. I was looking into whether there were any differences in the way farms run by women differ from farms run by men in their use of agricultural water management, which refers to how rainwater is effectively used on the farm to manage crop water requirements. The two locations I was doing my research in are considered semi-arid areas, with Makindu being drier than Machakos. The primary source of water for crops is rainwater. A successful farm would be one where the planting of crops was timed perfectly with the rains and one where rainwater was being captured for use during the drier times. ICRISAT was partnering with KARI (Kenya Agricultural Research Institute) and they provided me with a guesthouse for my stay at their campus in Katumani, about 10 kms outside Machakos. I was the only one at the guesthouse and thus had my own personal cook for my stay. There was no running water but the tranquil setting in hilly Machakos country is just what I needed after the past few months spent in the busy city of Nairobi. I enjoyed the clear night skies and enjoyed a return to a simpler life that comes with living at a remote research station. 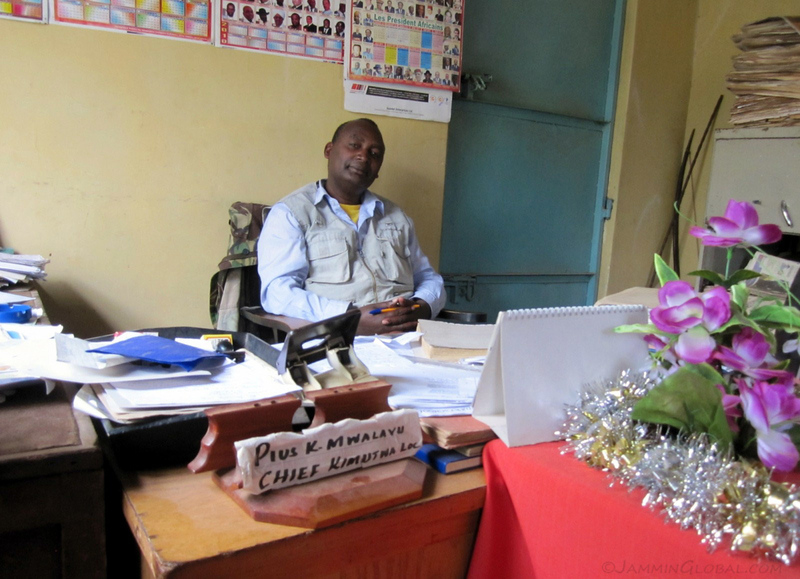 Members of my field team in Machakos, Chris Musyoki and Francis Mbondo. 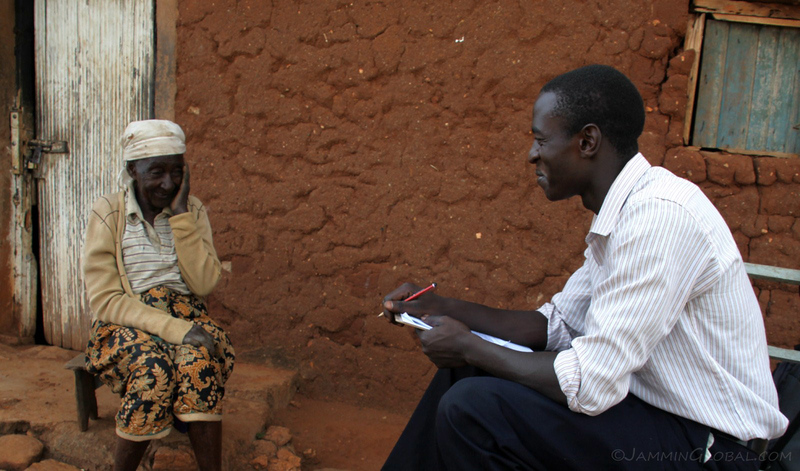 My data collection would involve conducting interviews with farmers and taking soil samples from their farms. Since I didn’t speak the local Kikamba language, I had two enumerators, Chris and another guy, Bill to take the questionnaire surveys for me. Francis was one of the farmers in the area and has worked with research teams before and he knew the location of all the farmers that I wanted to interview and thus he was our farmer guide. 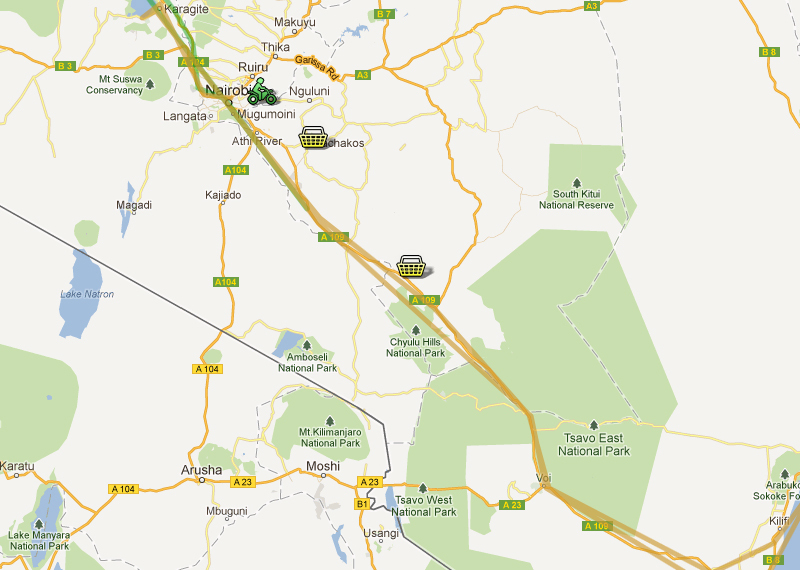 A map of Kenya showing the location of my two field sites, Machakos, closer to Nairobi and Makindu, further down the highway to the coast. Click on it to go to the interactive version in Google Maps. 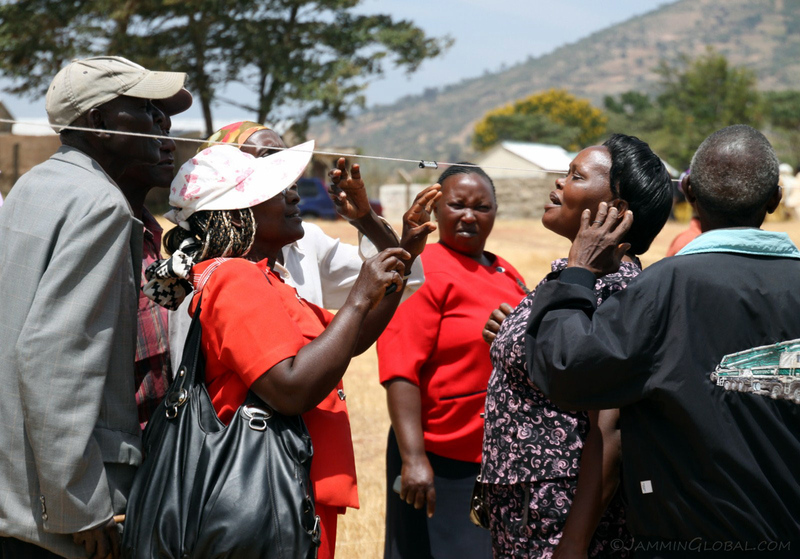 My research in Machakos was based around the dormant Kiima Kimwe volcano and focused on farmers living in villages that were either side of the Mwania River flowing around the base of the volcano. Bill asking a male-headed household questions from the survey that I prepared. I was basically just supervising, and taking photos, while the team went about its business. 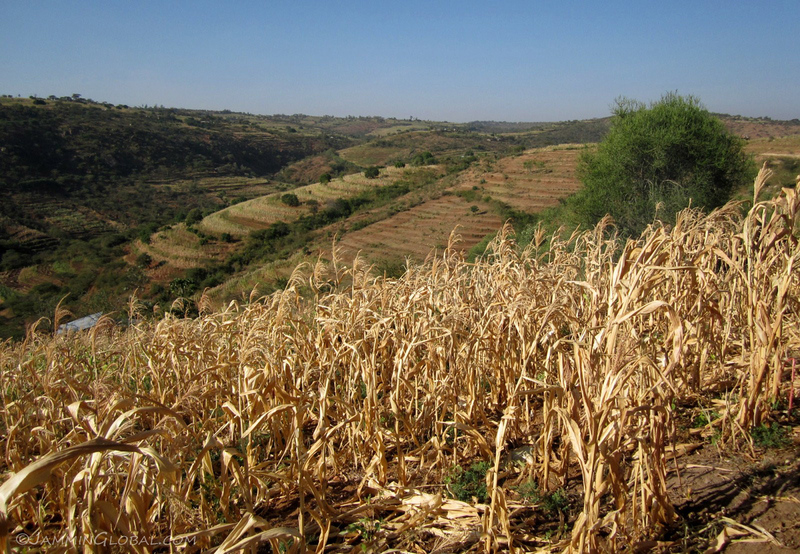 Most of the farmers in the Mwania watershed (the area drained by the Mwani River) are considered poor and have to rely on food aid handouts to meet half their monthly food needs. 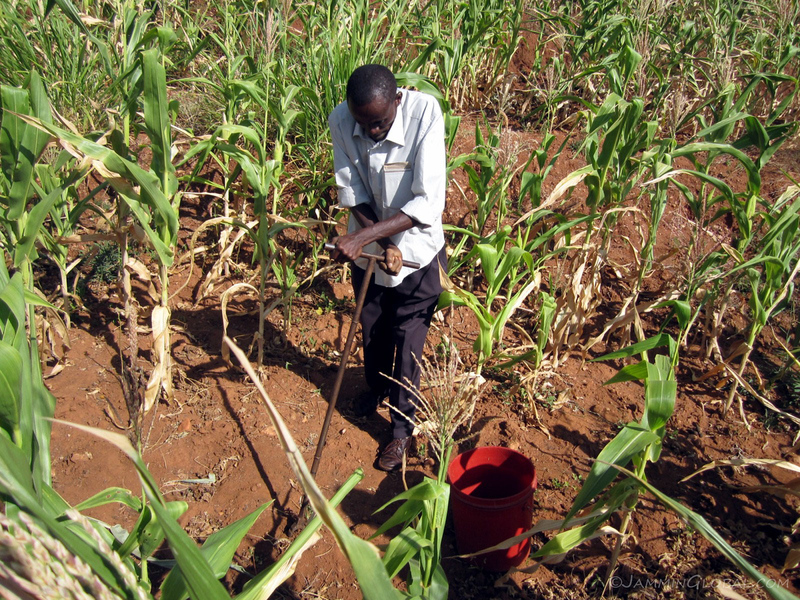 Ruben, an office assistant from KARI Katumani takes a soil sample using an auger from a maize field. The idea was to compare soil fertility between farms run by women and those run by men and see if there was a link between the gender of the farmer and soil fertility. Past research has shown that women’s farms in Africa, in general, have less fertile soil than men’s farms and this has mainly been because men are more willing or have more capacity to apply farm technologies, such as fertilizer to their crops. 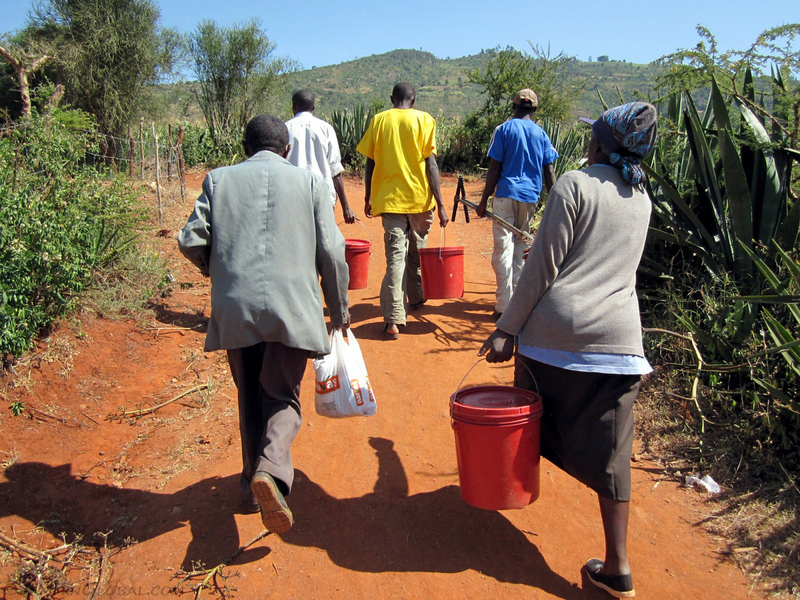 My field team walking to the next farm. 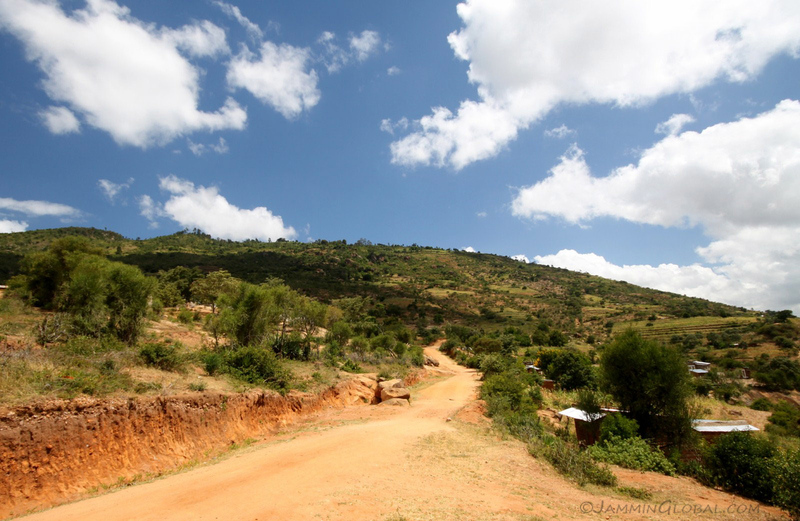 It was good exercise to be walking up and down the hilly countryside of Machakos. 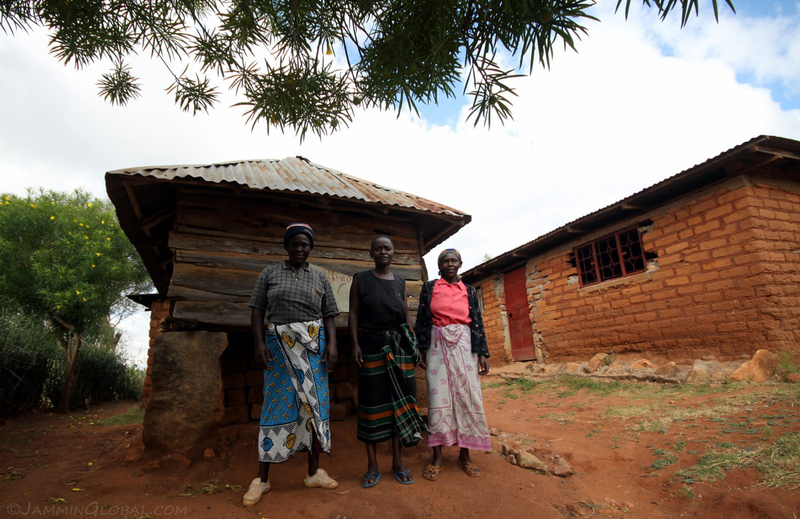 A group of women farmers posing in front of their granary. 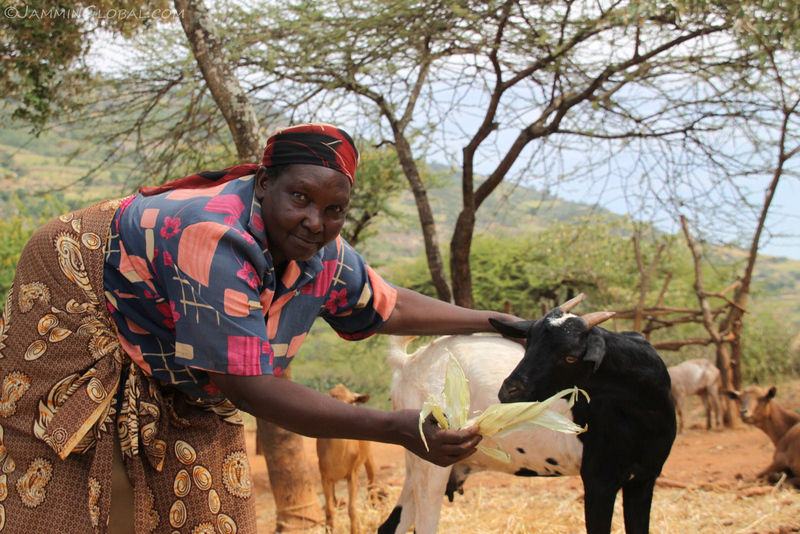 Most women became the head of their household when their husbands passed away but for some their husbands found jobs in town, leaving the farm to be managed by women. 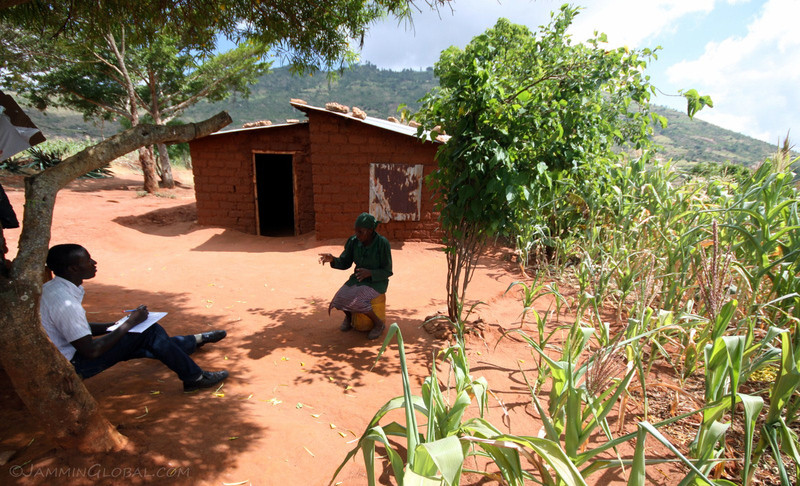 Chris interviewing Beth Musau, 74 years old, living in that small house and managing about 1 acre of farmland. 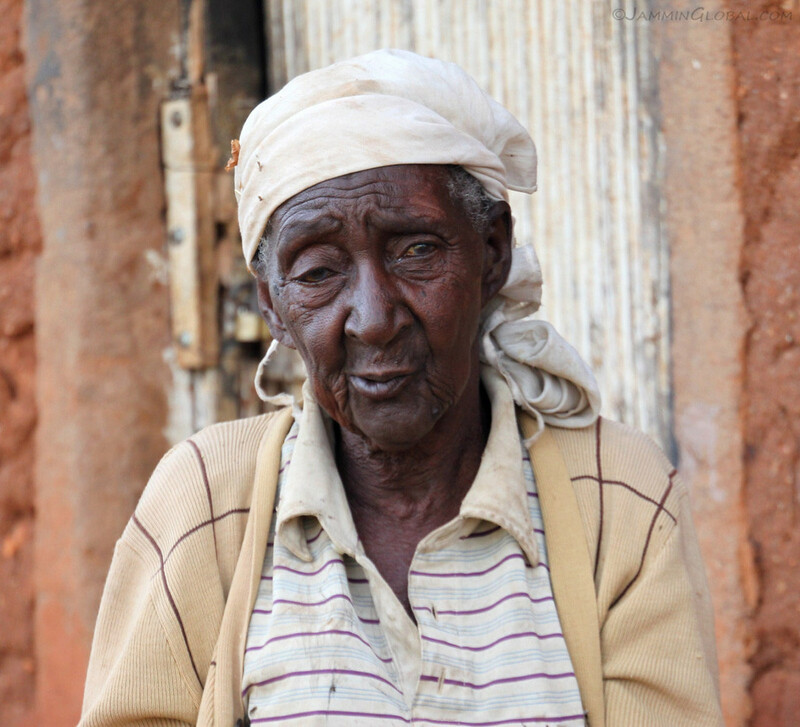 She asked our help in understanding some paperwork she got regarding receiving aid handouts. 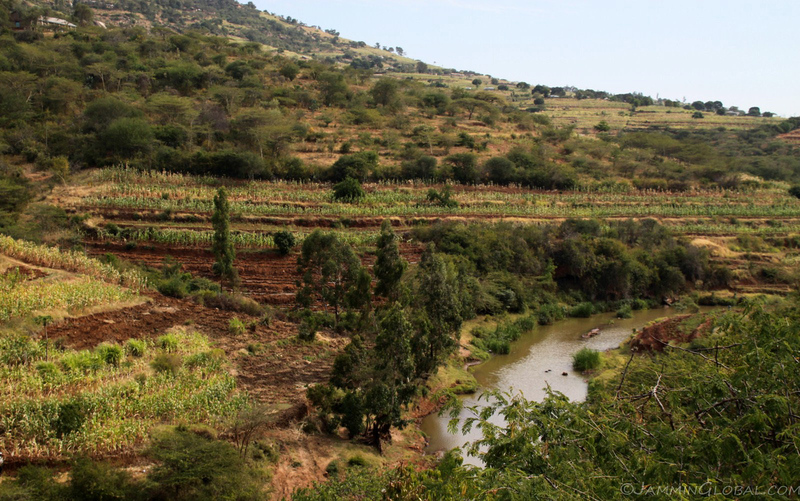 The beautiful farmland around Machakos. 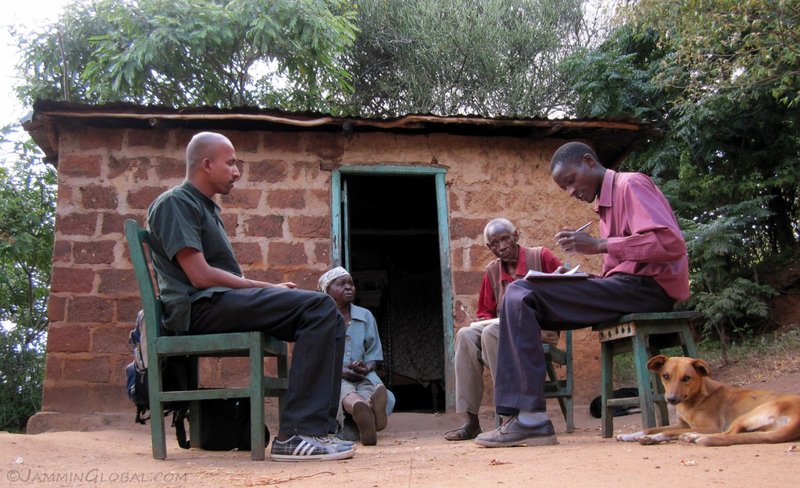 Chris trying to keep the interview light-hearted with Esther Nditi, who was 98 years old and living by herself in this small mud house and farming about an acre of land. 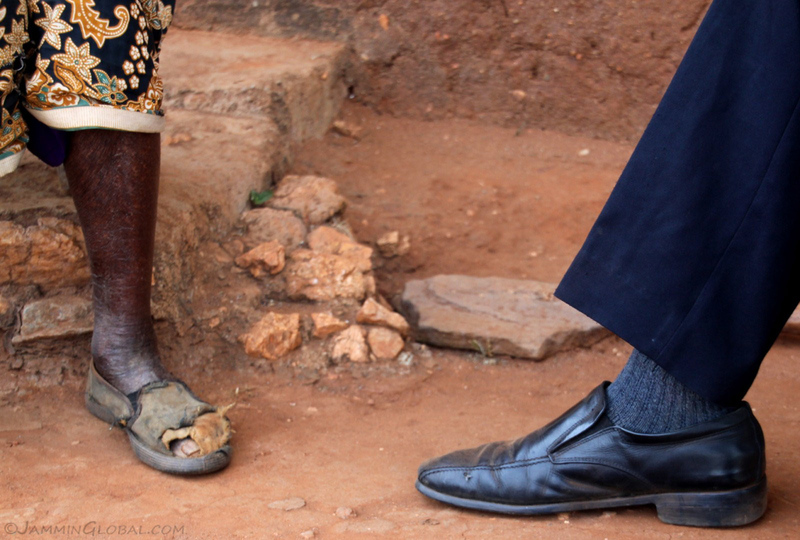 The difference in footwear between a 98 year old woman farmer and a 22 year old engineering student. 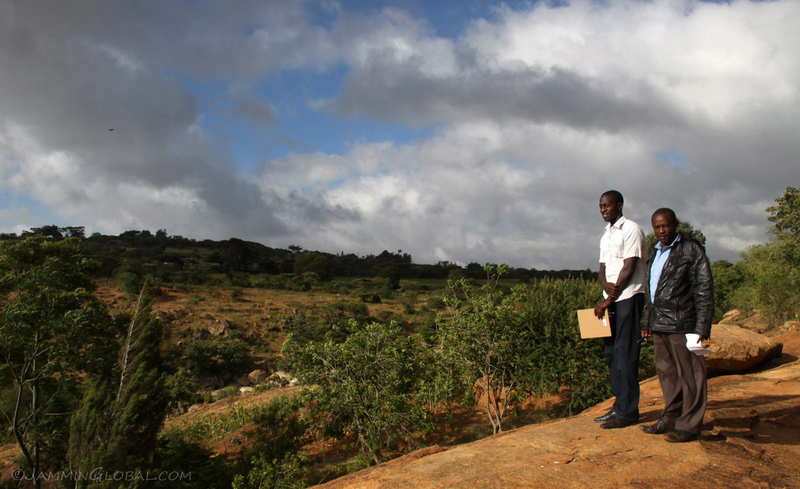 Chris was studying at University of Nairobi but since his father worked for KARI, he helped out with research surveys for some extra cash. 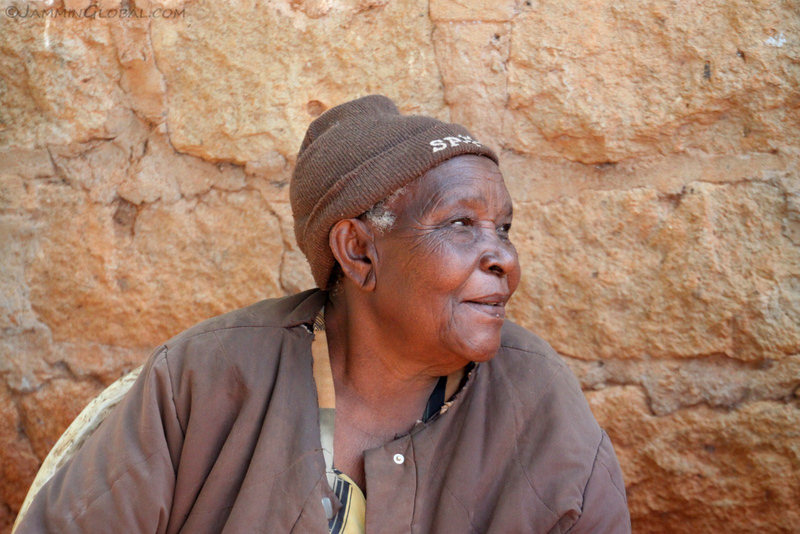 Esther Nditi at 98 years old and looking pretty healthy. The only issue I could see was a lazy right eye, besides that, she was moving around on her own and farming a terraced plot of land. 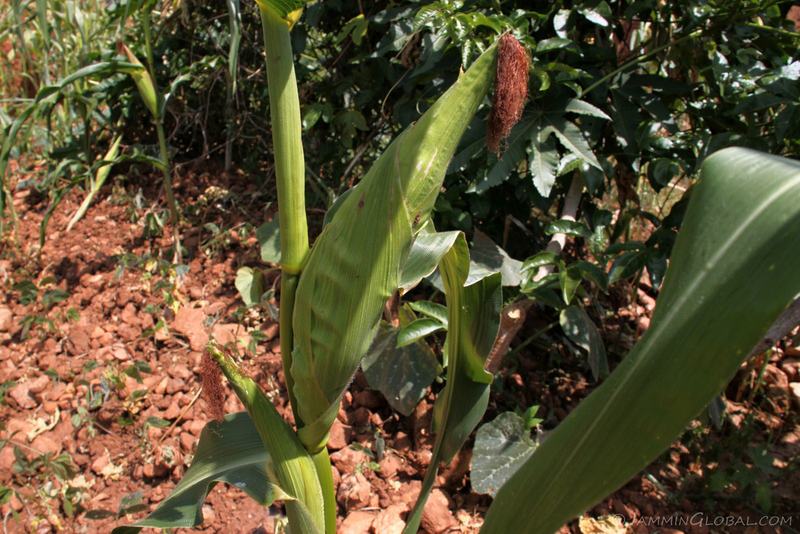 Maize is the main crop that’s planted, since ugali is the primary staple food and beans and legumes follow closely. 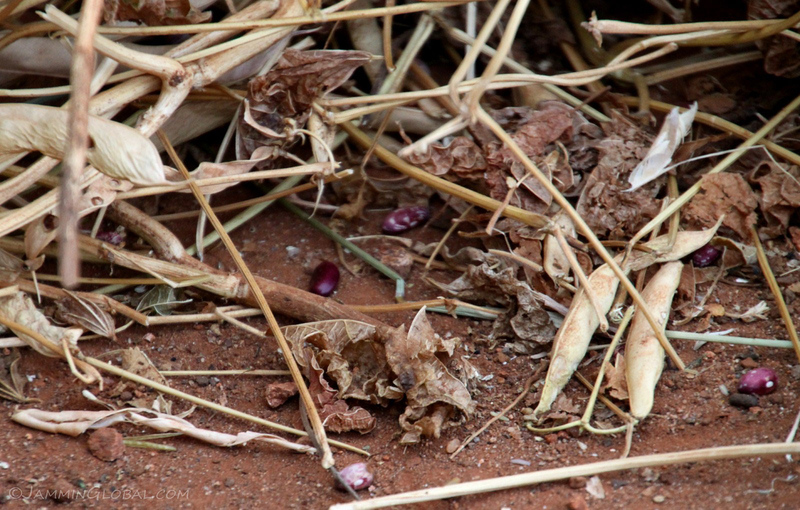 Here, dried up bean plants have been collected, ready to be threshed and loosen all the beans from the pods. 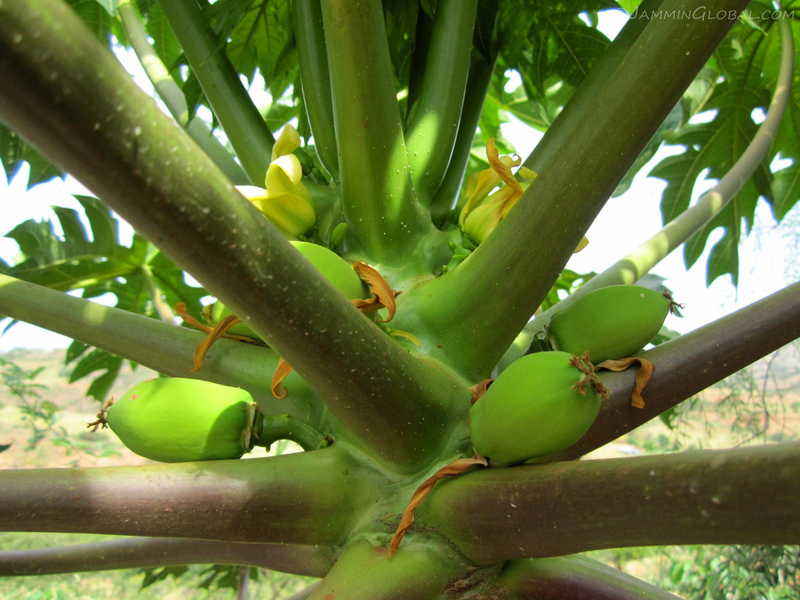 Baby papayas growing into additional income for the farmers. 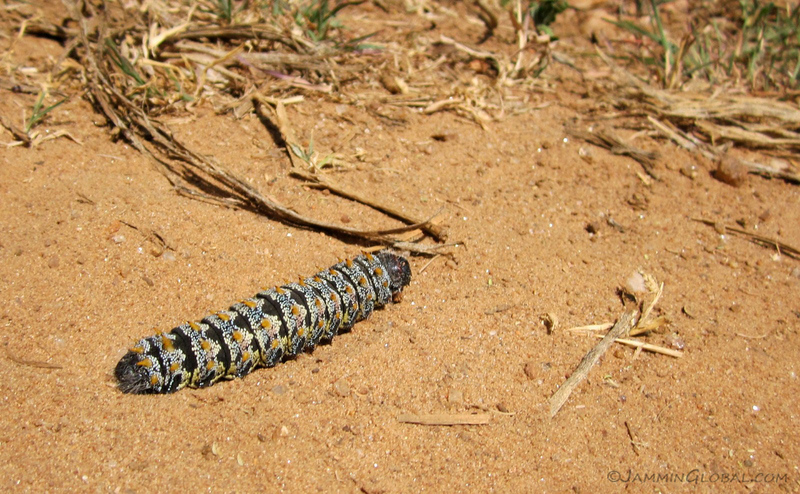 A colorful caterpillar crossing the road. …some farmers had healthy looking ears of maize. So, it wasn’t all down to the rains, but also crop management as in when the crops were planted, was any fertilizer, such as manure added, etc. I interviewed about 45 female farmers and 45 male farmers. There are many times more male farmers than female farmers but their percentage is increasing with women standing up and claiming their share of farmland when inheritances are split up and some single women were buying land to claim financial independence. 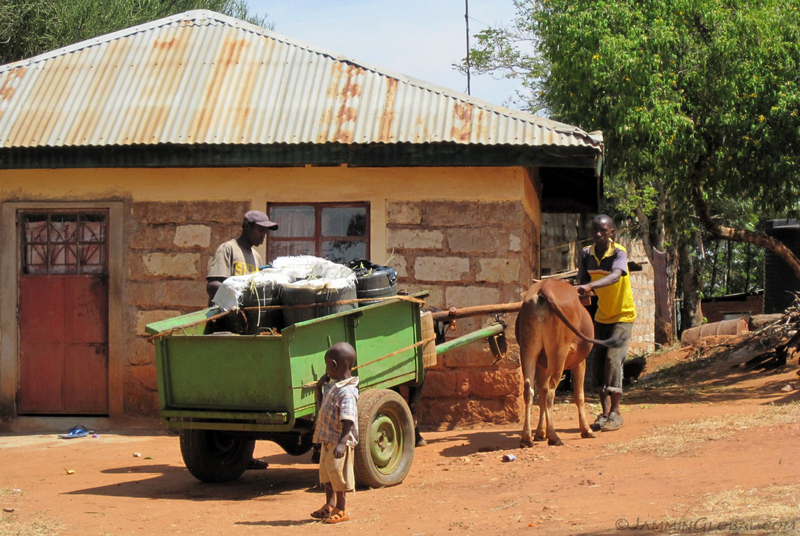 …pay for water supplies to be brought by donkey from town. 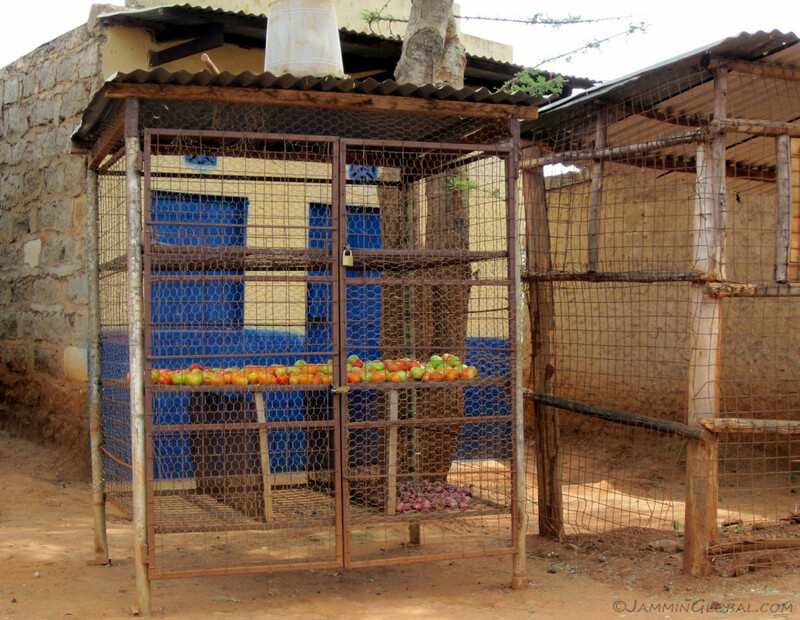 A pretty sparse-looking grocery store in the village of Kaathi. 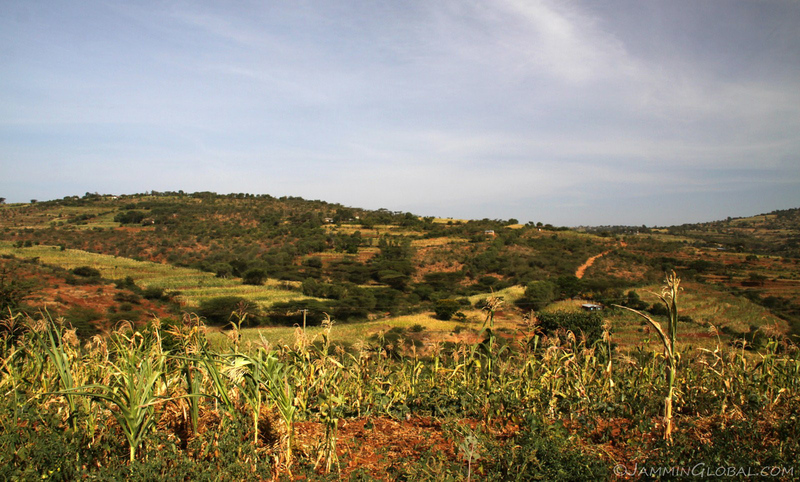 The town of Machakos was about 10 kms (6 mi) away and by foot, that’s quite a long ways, so most farmers ate what they grew on their farms (maize and beans) with a few lucky ones being able to buy some extra vegetables from town. 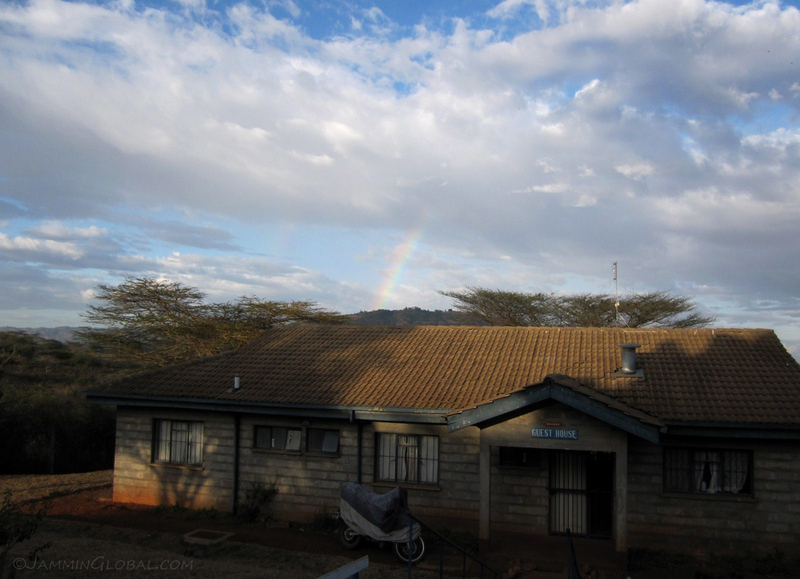 I stayed in this guest house at the KARI Katumani research campus, outside Machakos and enjoyed the tranquil pace of life. 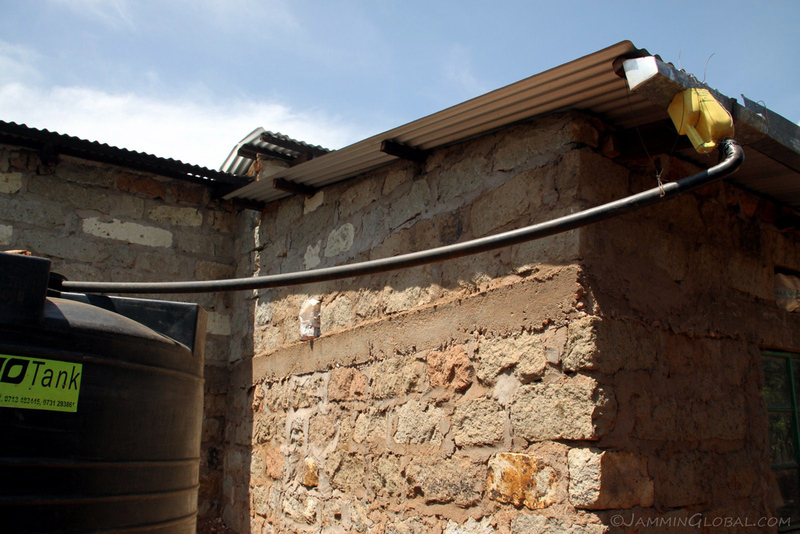 It was a spacious setup but lacking funds for repairs meant that there was no running water, so bucket baths. 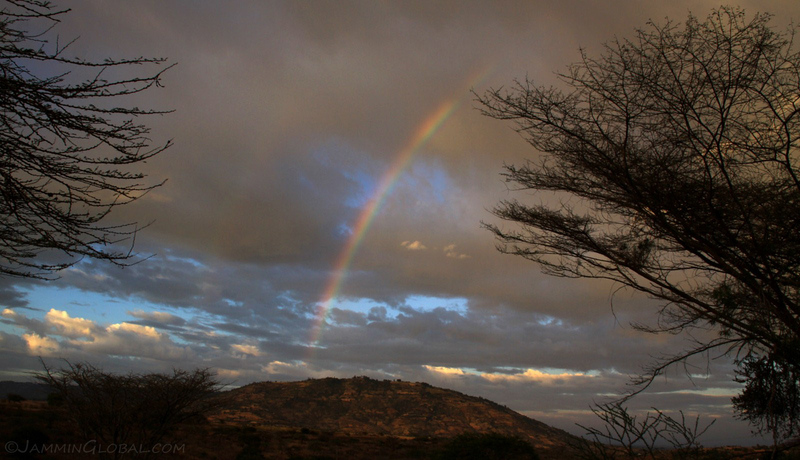 I had a beautiful view out the back of Kiima Kimwe volcano and on this day, I was presented with a double rainbow. Wow. 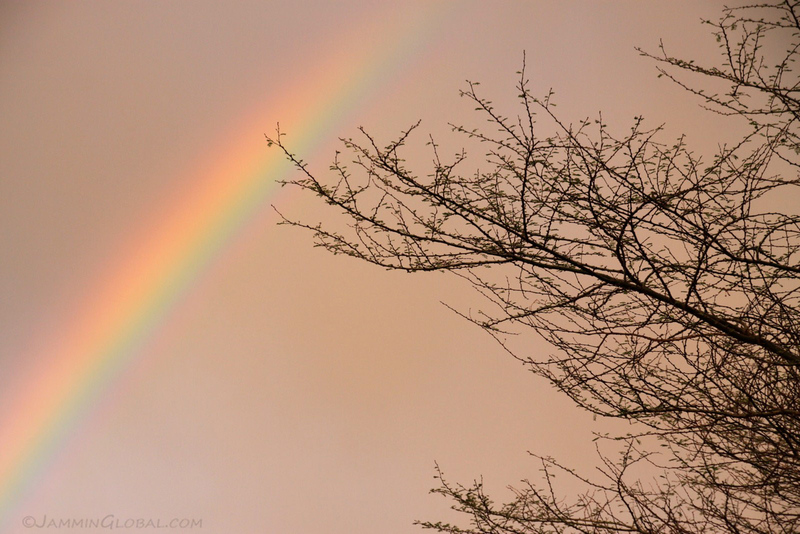 It was nice to see all the colors in this strong rainbow, reminding me that visible light is made up of a spectrum of colors. 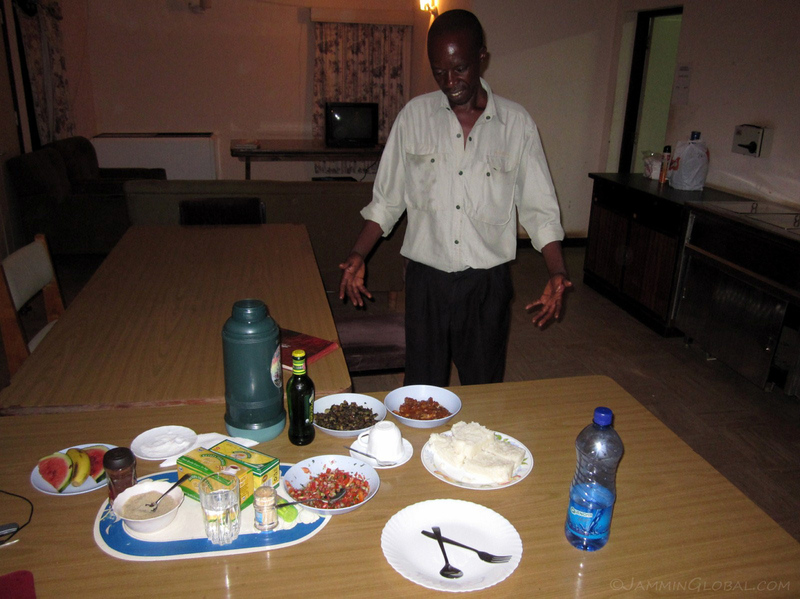 Kimwele, my cook at the guest house presenting dinner for the night. 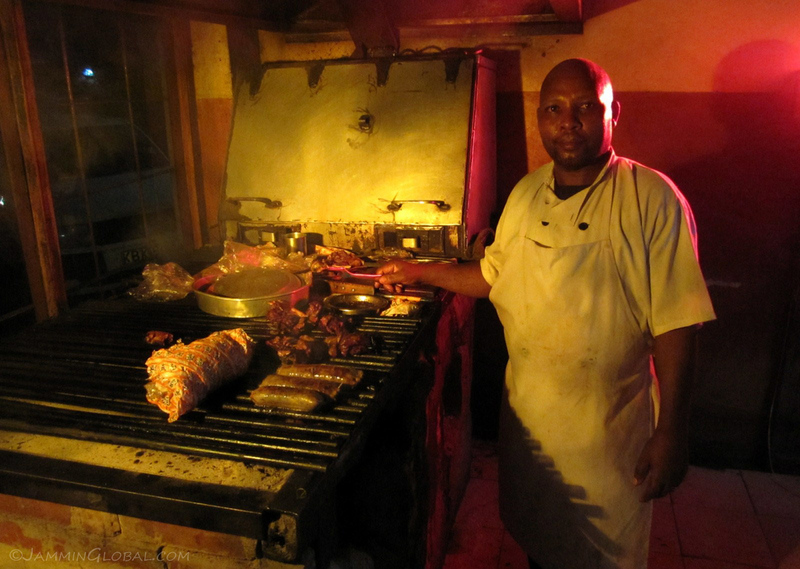 He made excellent Kenyan food during my stay and I slowly got him to add some ginger and garlic to the vegetables – much more to my liking. 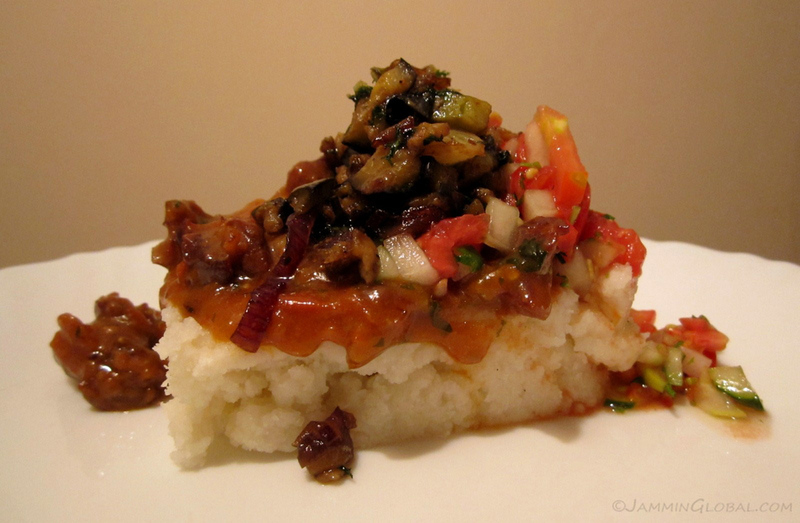 A serving of some typical Kenyan food, presented by Chef Jay: ugali (hardened porridge of maize meal), topped with goat stew, a salad of tomatoes, onions and cilantro and sauteed aubergines (eggplant). Chris and my driver, Njeru, checking out sanDRina one morning when they came to pick me up for the day. 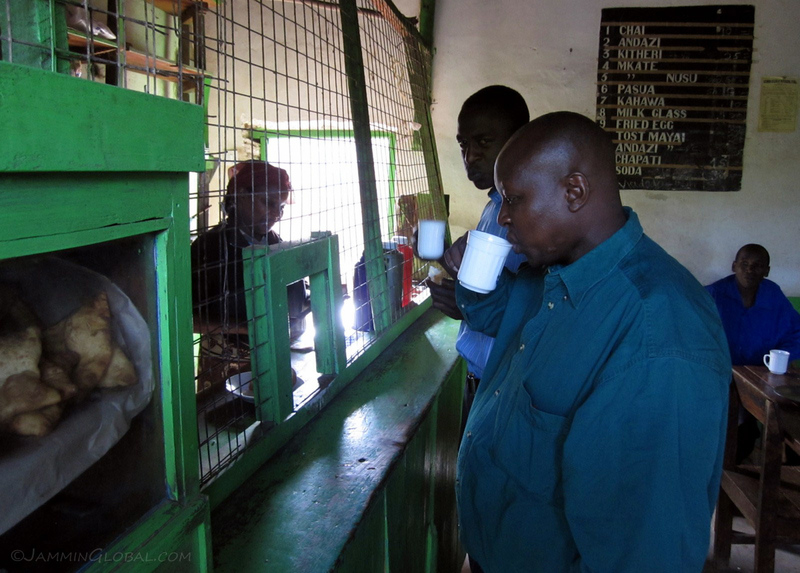 Getting a cup of chai before driving off into the countryside for another day in the field. Visiting some farmers who were at the bottom of the watershed, near the banks of Mwania River, where the soil is most fertile. The hilly nature of the land naturally lends itself to being terraced. We came to interview the lady on the right but her new neighbor, a single woman farmer also wanted to be interviewed, in case there was some direct benefits of being involved in research programs. My research was more of a case study and snap shot, therefore it doesn’t have any direct benefit to the farmers except that I shared with each farmer my soil analysis from the samples that I took from their farms to help them understand what they should do to get more produce from their land. Gladys Mbesa posing with a prized goat. 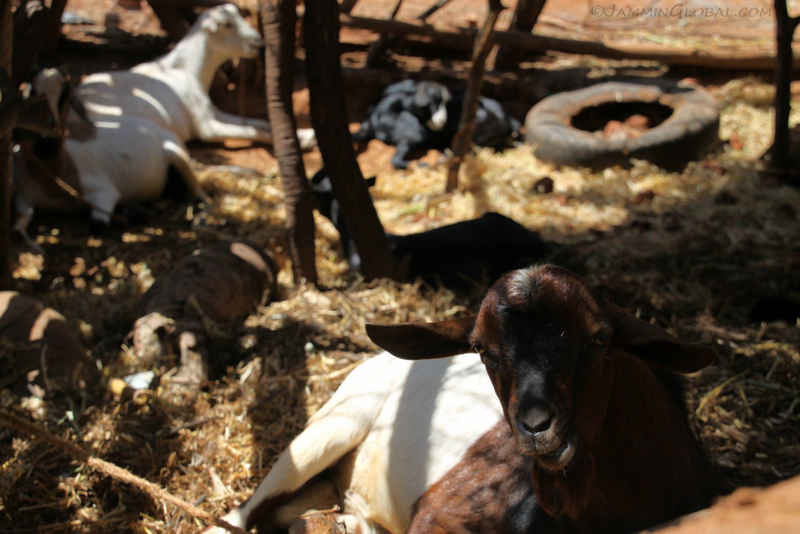 When I asked most farmers, especially women farmers, if I could take a photo of them, they all wanted to pose with their goats. I later found out that this was because goats were recently handed out to women farmers to supplement their income and it was seen as a status symbol to have some livestock in addition to just crops. 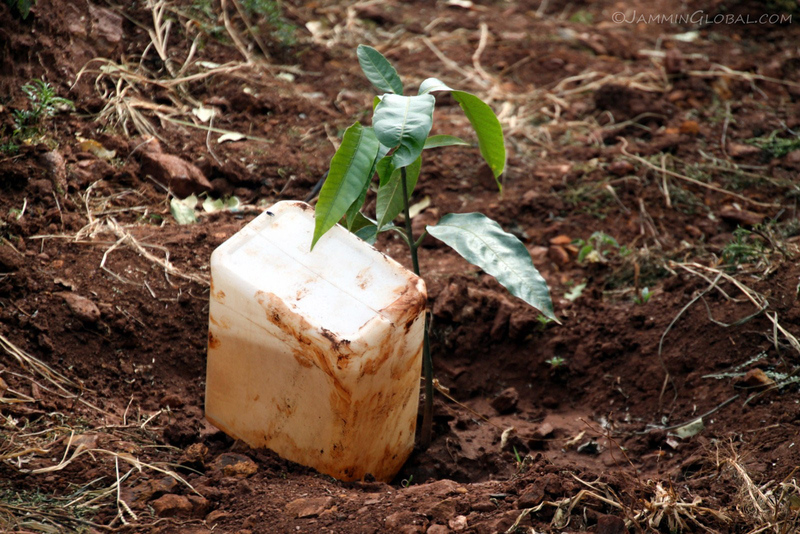 Gladys was planting mangoes to diversify her crop income and this was a simple but great idea to ensure a slow and steady water supply for each baby mango tree – it’s an upside down jerry can with the mouth in the soil, slowly giving it water as it gets used up by the plant. Half the villages that I was surveying were under the Kimutwa Location and we had to pay a customary visit to the government chief to let him know who we were and what we were doing here, although I’m sure he already knew as word spreads fast in rural communities when strangers are walking through and talking to the locals. 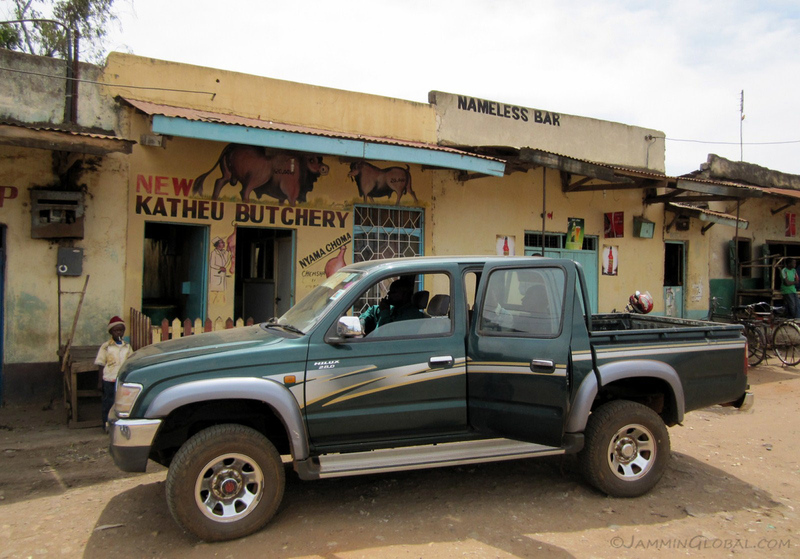 Having lunch in Kimutwa at the Katheu Butchery. KARI provided the use of this Toyota Hilux pickup truck for my fieldwork and its offroad abilities were definitely needed on some steep and craggy roads. The butcher had some special meat today, a whole cow’s head. 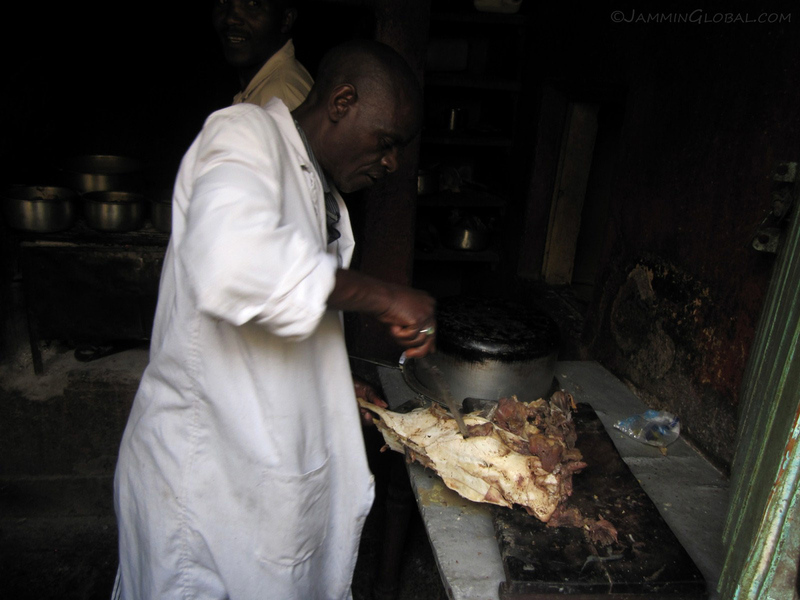 It was boiled for a long time and now with the meat softened, he was carving out chunks from all the different pockets. Cheek meat was said to be the best. 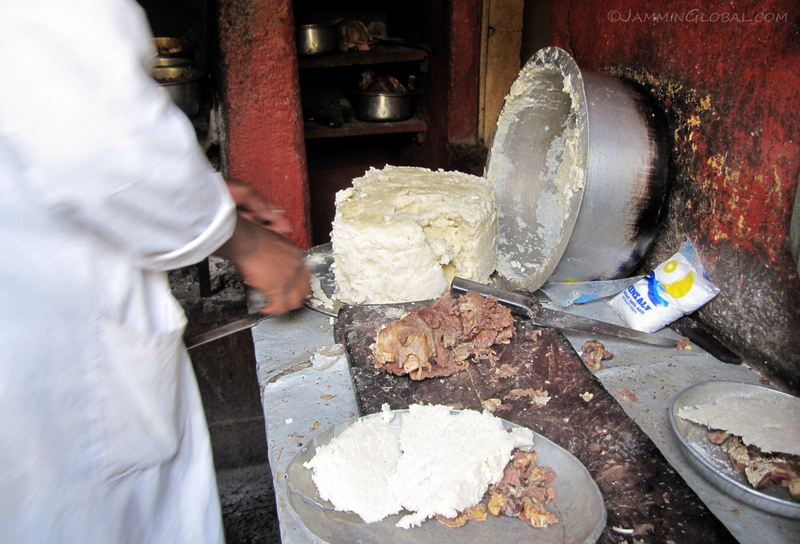 Cow’s head meat served up with a big old slice of ugali and salt. 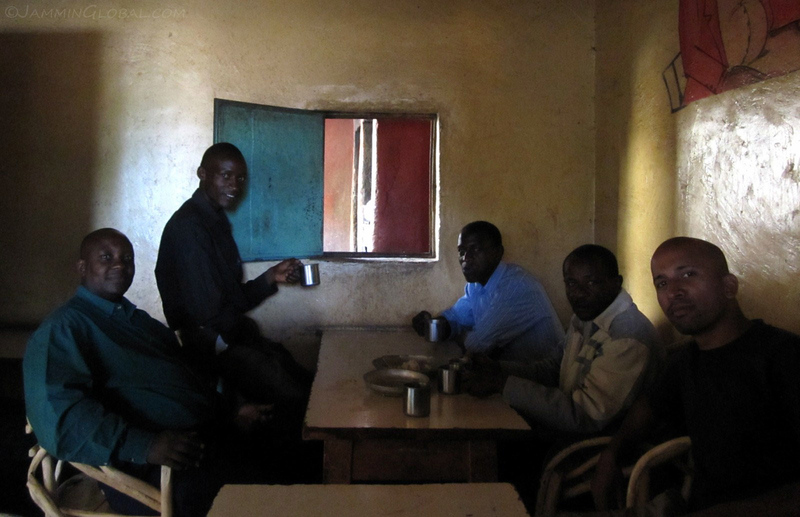 Me and my field team having lunch at Kimutwa. We finished the meal with a hearty, protein-rich bone soup. 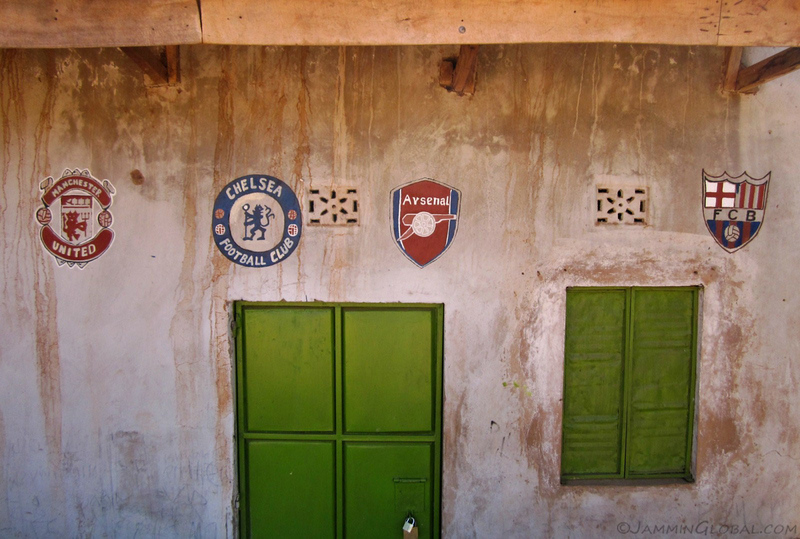 Proud football fans in every little village. 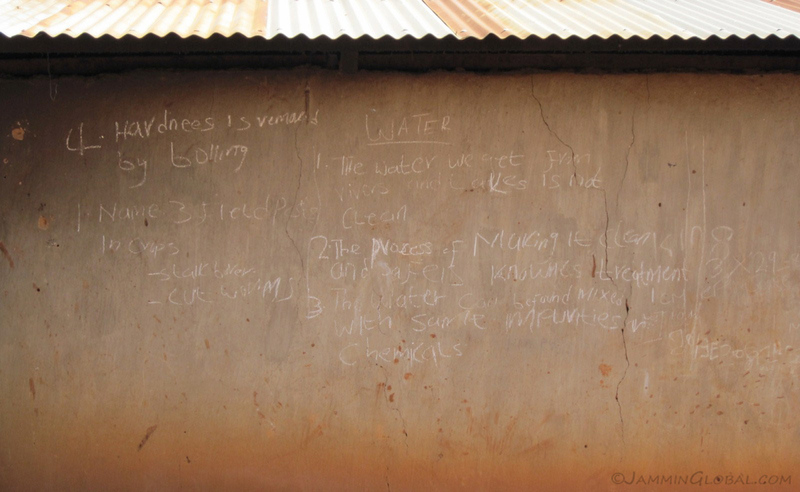 Some writings on a school wall that we passed. In-between my fieldwork in Machakos, I attended a two day workshop in Makindu that brought together many different players to solve this issue of how to get the small-scale farmers in the area to be more food self-sufficient and less dependent on food aid. Here, a farmer representative is speaking up and saying that they were willing to try whatever new agricultural technology was available but that they needed funds to implement these schemes. 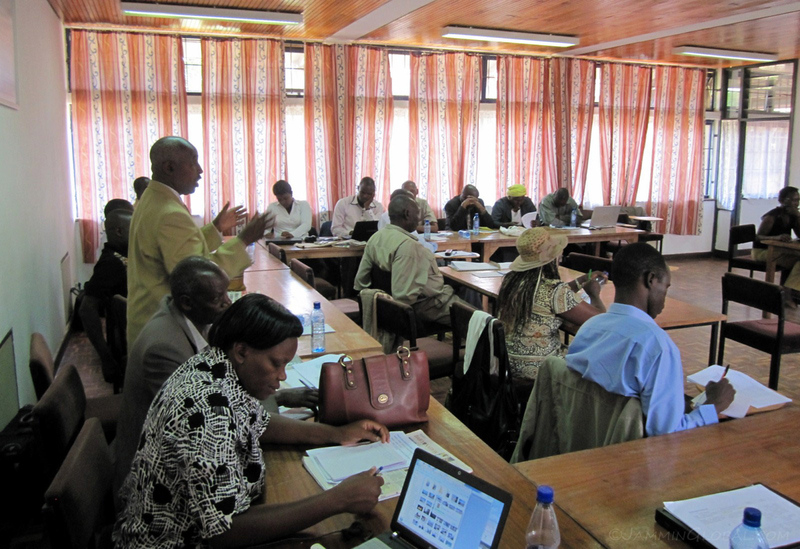 Representatives from the Kenya Ministry of Agriculture and Gender were there. 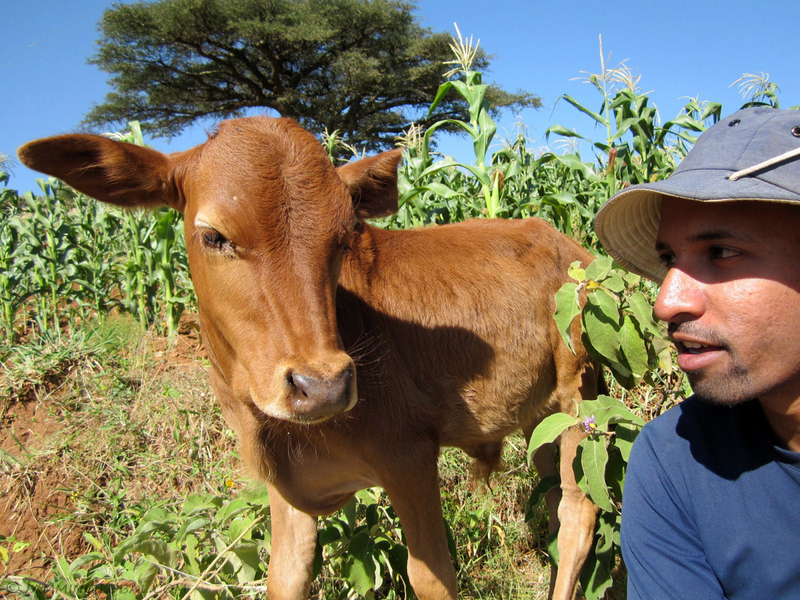 Back in the field in the Machakos and getting friendly with a calf. 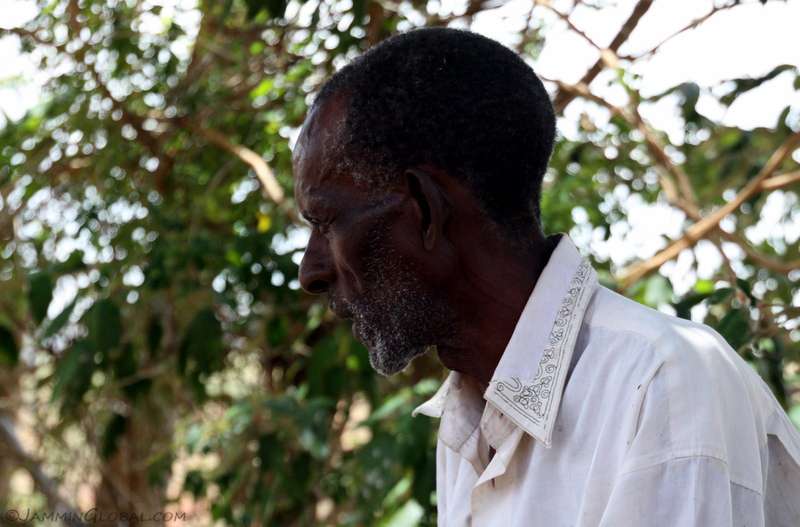 My farmer guide, Francis, who at 75 had a lot of energy and was a pleasure to work with. 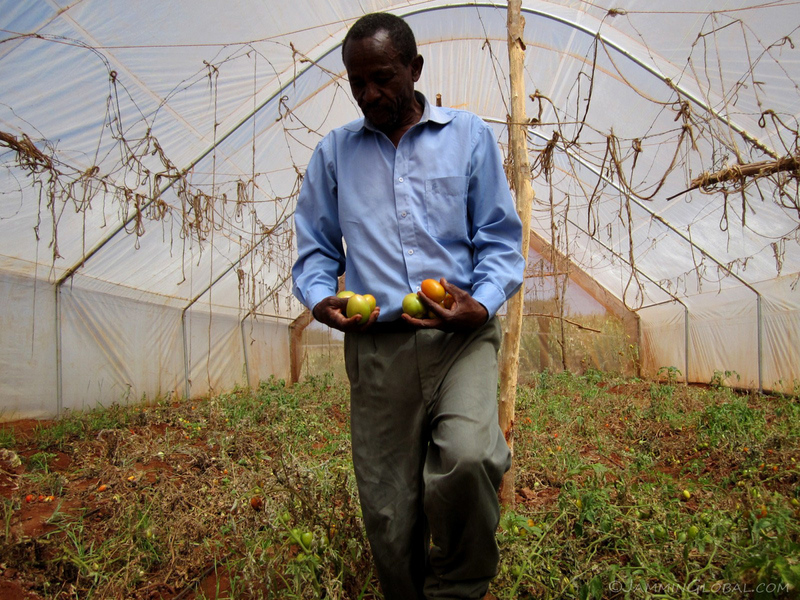 Being one of the better-off farmers in the area, he could afford to setup a greenhouse to grow tomatoes. They fetch a much higher profit than maize at the market, but they require irrigation, unlike maize which can mature with just rain water. 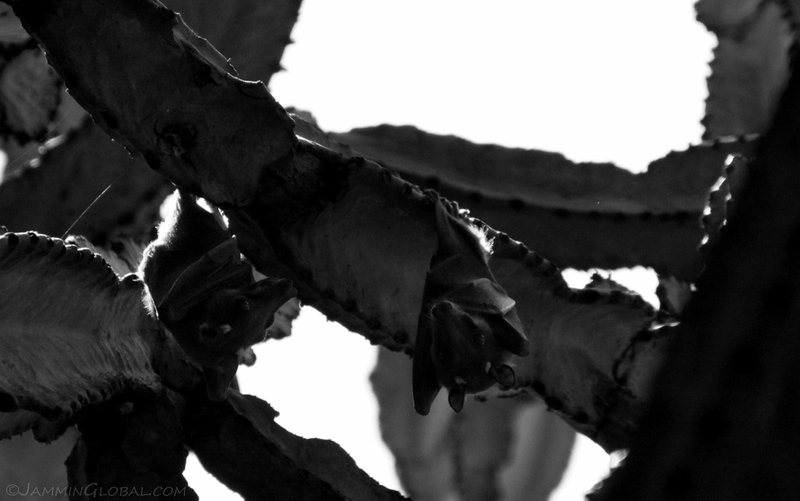 Fruit bats sleeping off the heat of the day in this cactus tree. 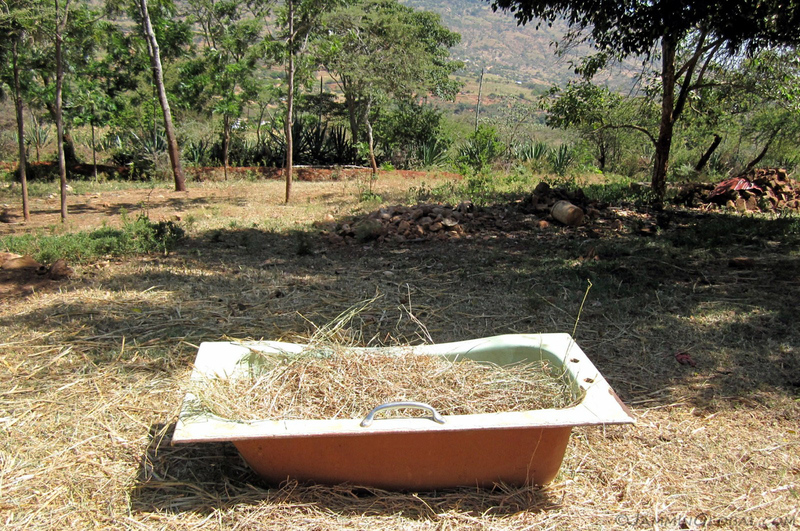 A bath tub turned into a goat feeder. 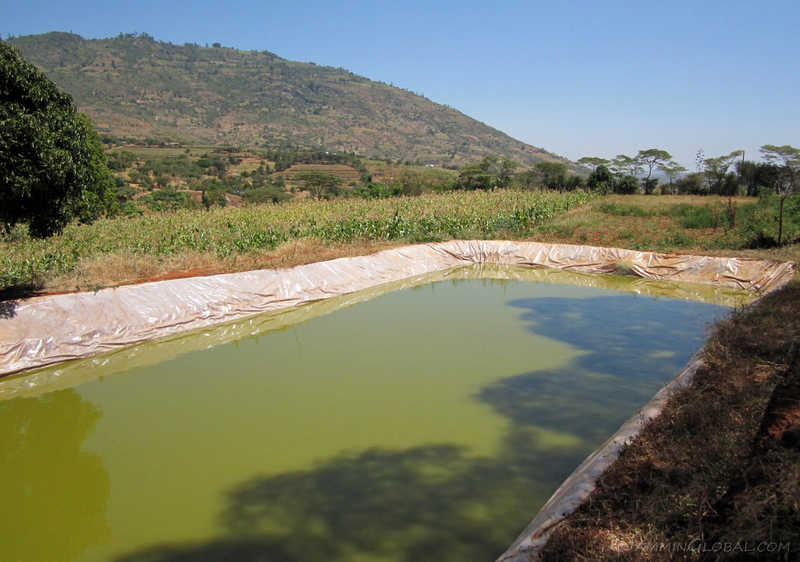 An experiment into aquaculture; growing fish in a giant pond. This was a joint project by many farmers to see the viability of producing fish as a supplemental income source. On a night out in town with my field team. 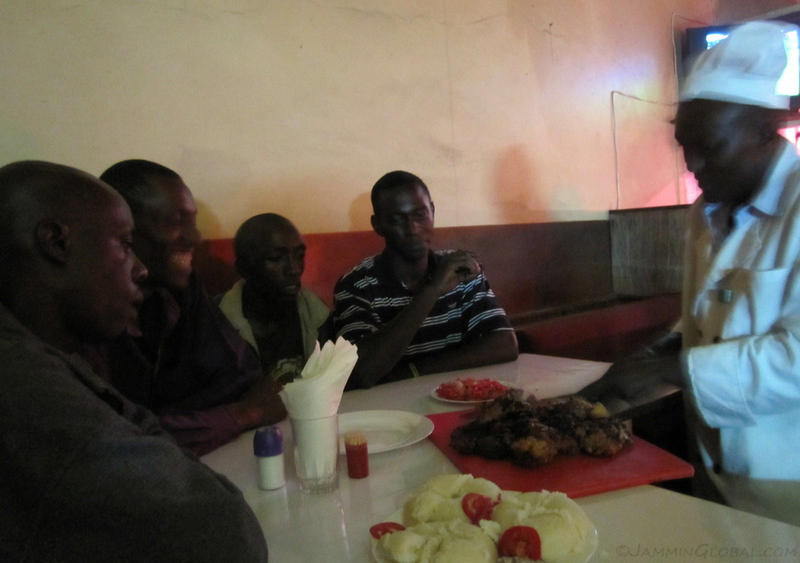 First stop, some nyama choma. A bunch of happy Kenyans; lots of nyama choma and ugali. 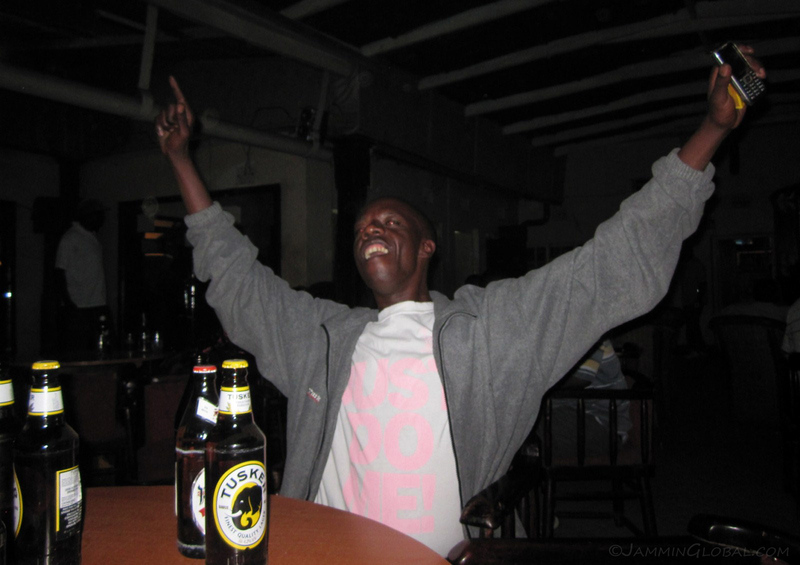 Then the drinking started and my cook, Kimwele, who’s usually a very restrained family man, let it all hang out. Good times. 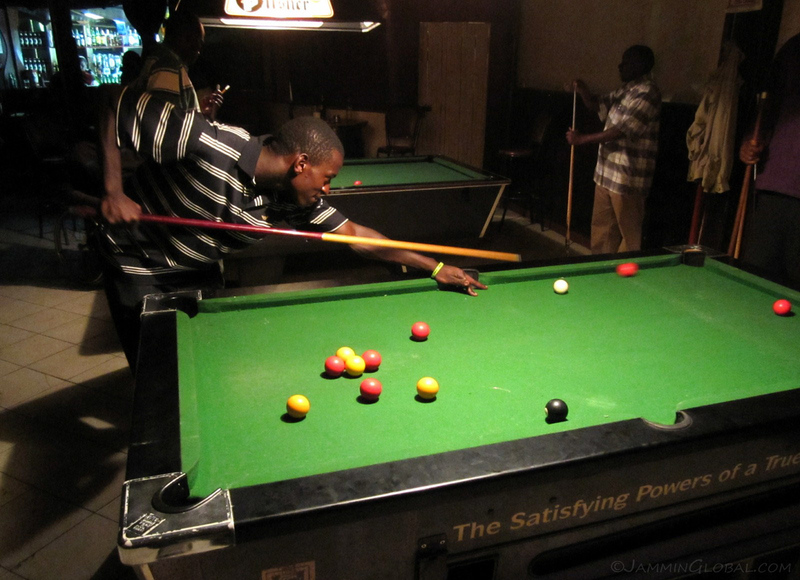 Chris hustling someone at a game of pool. 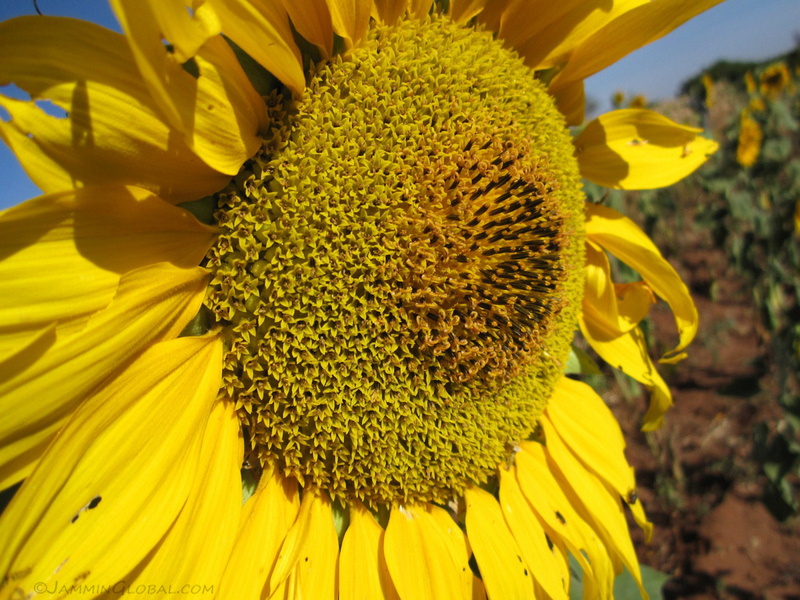 A bright sunflower in the experimental fields at KARI. They’re grown for their seeds, which are a great snack and also provide cooking oil. A chickpea in its pod. This is where hummus and a lot of Indian food comes from. 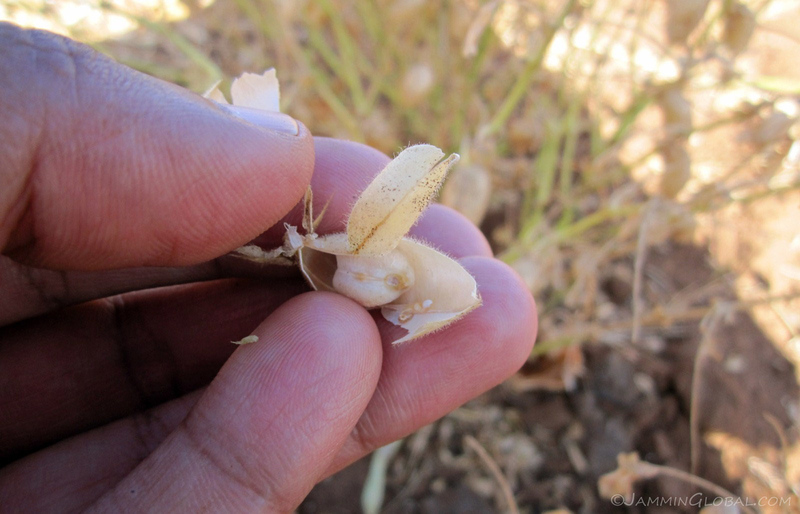 Farmers were being encouraged to grow some chickpeas as they provide a much higher profit than maize but since it’s a product that the local farmers don’t eat themselves, it’s hard to convince them to sow anything other than maize on their small plots of land that have to firstly provide them with sustenance. 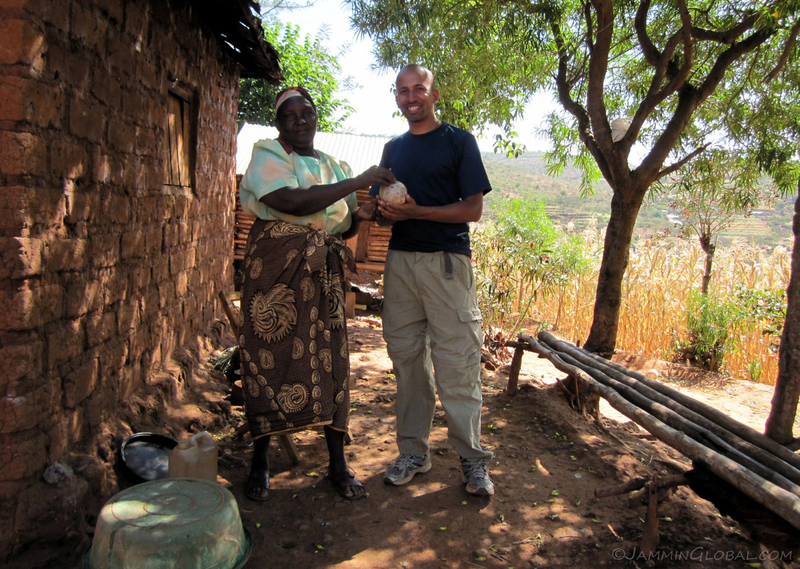 A woman farmer presenting me with a gift of a dried calabash after I expressed interest in some that were hanging in her house. I saw that calabashes were used as porridge bowls and wanted to make one for myself. 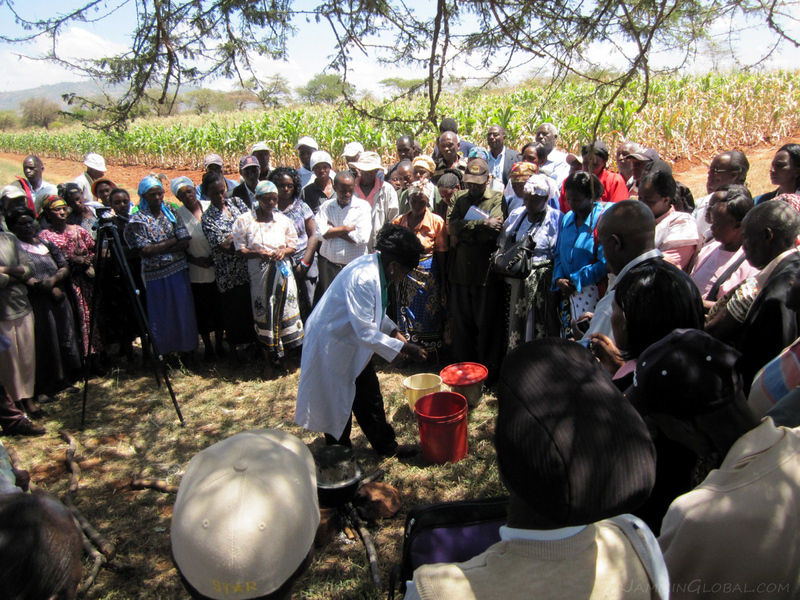 A demonstration at the research campus for the farmers in the area. They were being taught how to prepare and cook cowpea leaves, which are a byproduct from the main cowpea grain and are highly nutritional. 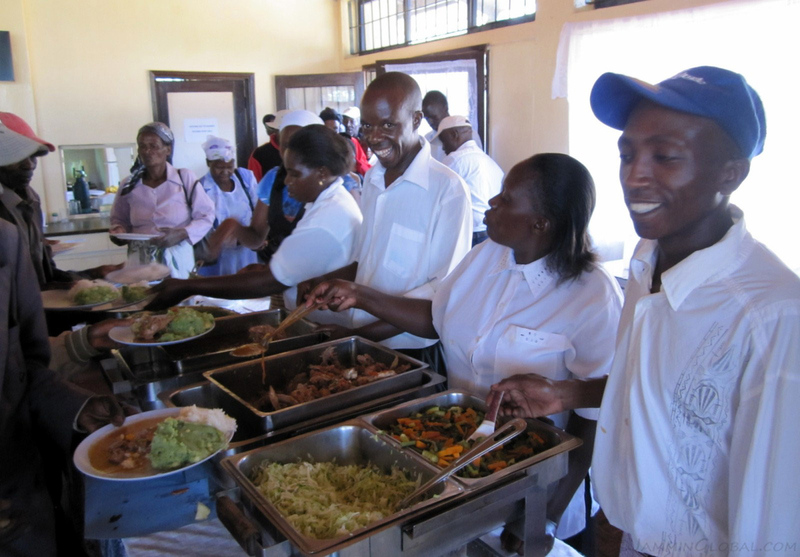 A complementary lunch for the farmers for attending the workshop. At another workshop, farmers are being taught how to best prepare terraces on their sloping farmland. 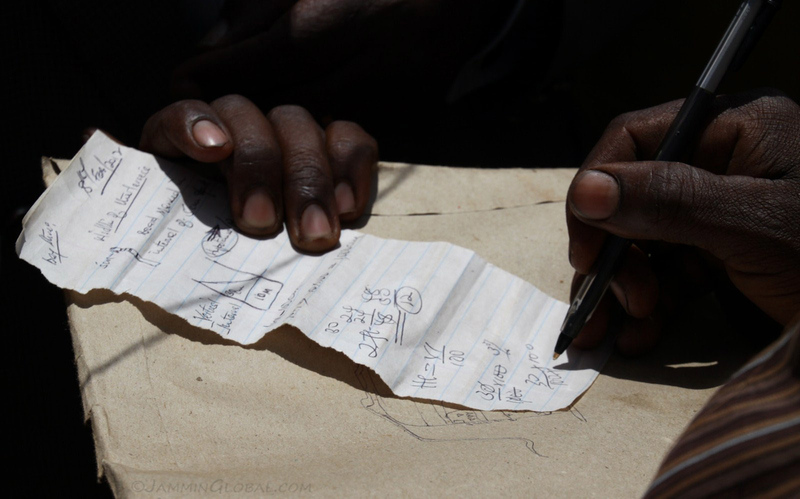 Some of the smarter ones were learning the calculations involved in designing sloping terraces in such a way that they captured sufficient rainfall without completely impeding its flow. 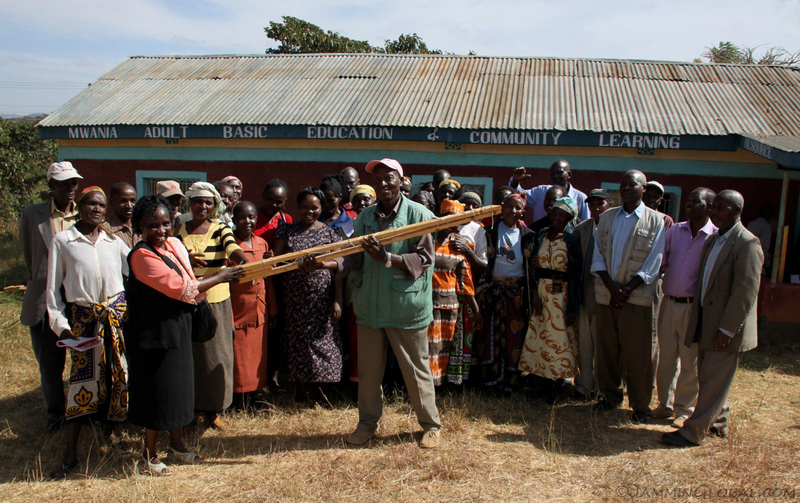 The farmers community being presented a tool that would help them in measuring and designing terraces. I really enjoyed the first half of my fieldwork in Machakos and was warmly welcomed by all the farmers. It was saddening to see the state of some of the farmers, especially the older widows, living by themselves and still having to farm to sustain themselves. 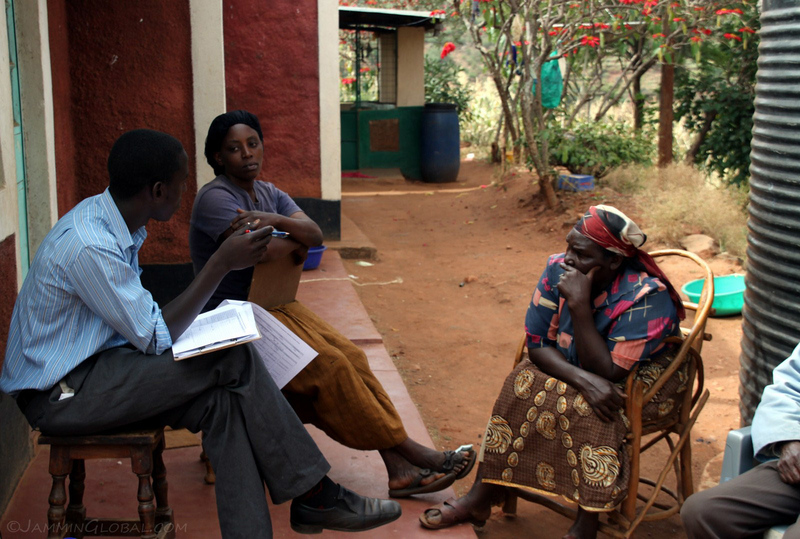 I was encouraged by their resilience and energy in making the best out of their situation. Awesome work Jay, I have a lot of nostalgia just seeing the pictures from then.